JADE: natural stone of New Jade (Serpentine). 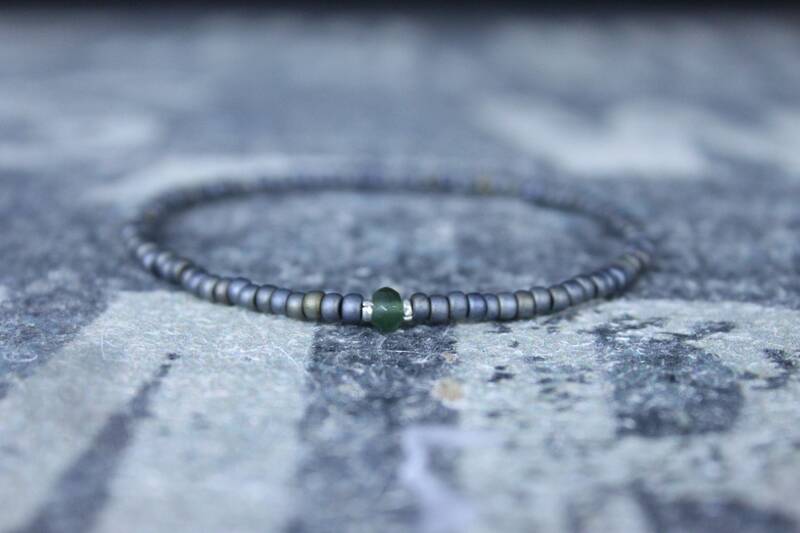 Jade stands for ABUNDANCE, MONEY. SEED BEADS: premium quality small beads manufactured in Japan by renowned TOHO. SPACERS: Thai* or Ethiopian** silver spacers - please choose. *THAI SILVER is a high purity silver (97%-99%) that will not tarnish as readily as sterling silver (92.5%). These fair trade spacers are handcrafted by Karen Hill Tribe artisans in Thailand.The Karen Hill Tribe is the largest of the 6 principal hill tribes of Thailand. Historically the Karen tribe relied primarily on opium cultivation as their main source of income. In the early 1960's, the King & Queen of Thailand decided to help the Karen people develop an alternative to growing opium as their main source of income by teaching them as a new skill. 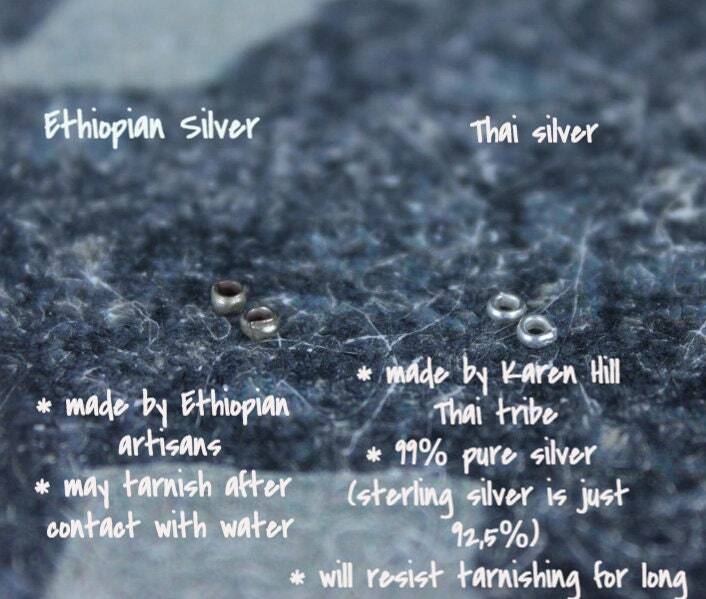 **ETHIOPIAN SILVER is handcrafted by Ethiopian artisans. 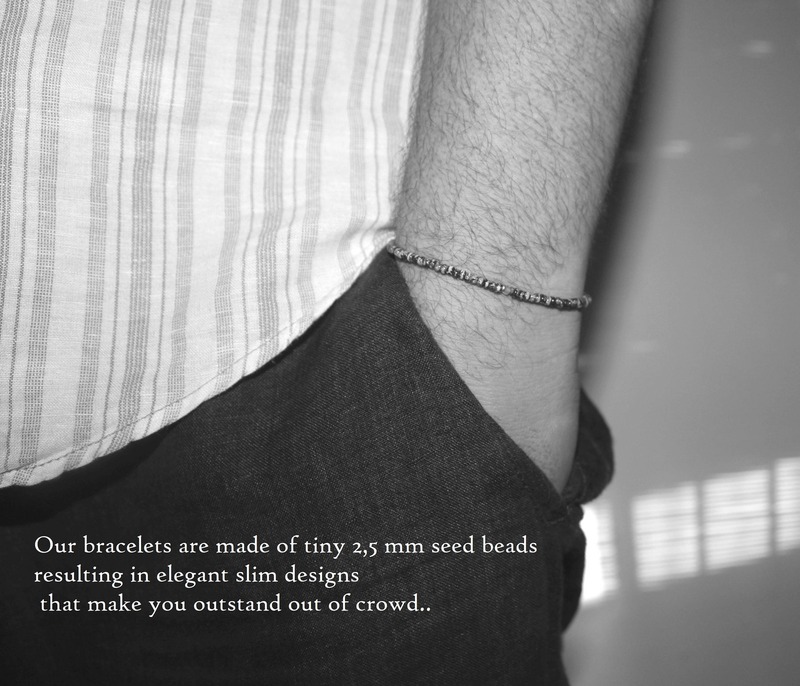 It will suit you if you want an artisan shabby touch on a pure line minimalist bracelet. It may tarnish after contact with water. To prolong its initial appearance try to avoid contact with water, alcohol, perfumes. Bracelet fits perfectly a 7 inch wrist. This is standard men's size. If you want to order a custom size tailored perfectly to your wrist, just tell us in the order note your exact wrist circumference. 2. Lay it down on a ruler. This is your EXACT WRIST CIRCUMFERENCE. Give us your EXACT WRIST CIRCUMFERENCE! DO NOT ADD anything to this number. DO NOT GET measurement from other bracelets or watches. The more exact your exact wrist circumference measurement is the better fit we can make for you. TAKE ANY 2 ITEMS OR MORE FROM OUR SHOP - GET FREE STANDARD SHIPPING - coupon is not needed, applies by default. 1. New Jade (Serpentine) - transparent green color from light grass green to dark grass green. Size and Form: 4 mm faceted. 2. Taiwan jade - opaque green grass tone with darker green veins. Size and Form: 4 mm round. We ship the next business day after we receive your order. Orders received on Friday will ship on Monday. Please note that our local time is GMT+2 hours. Standard International shipping may take up to thirty business days (saturdays and sundays do not count), although the majority of our orders arrive in five to fifteen business days. We do have shipping upgrades for extra charge - please to see price range for your area open shipping options at your order check-out. If you have not received your parcel in thirty business days (saturdays and sundays do not count) - please contact us. HOW TO MEASURE YOUR EXACT WRIST CIRCUMFERENCE? 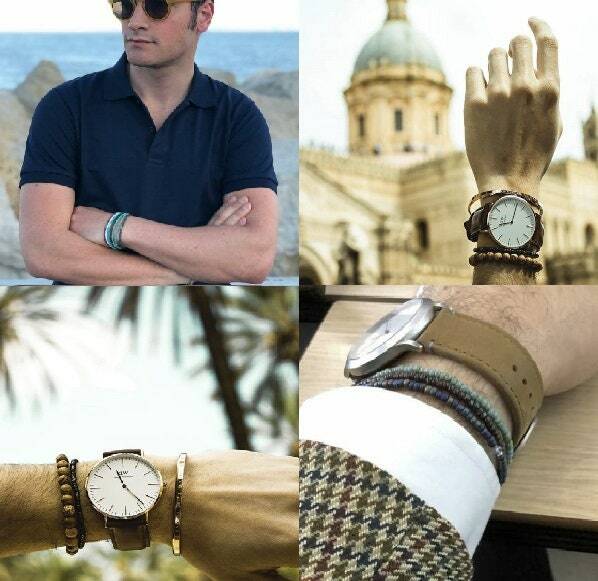 If you want to order a custom size tailored perfectly to your wrist, just tell us in the order note your wrist size. 2. Lay it down on a ruler. This is your WRIST SIZE. Give us your WRIST SIZE! DO NOT ADD anything to this number. 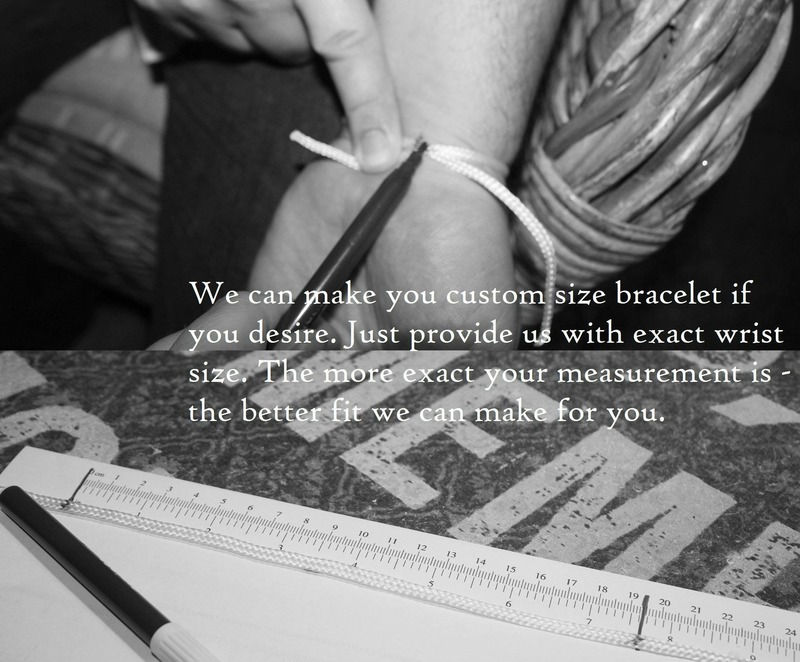 We will make you a perfect fitted bracelet. NB: do not give us measurement taken from other bracelet or watch. All our bracelets are beautifully packaged. If you desire you may add a gift note - we would add it without any extra cost. Rest Countries - 5-30 business days.
! Please note that EXPRESS shipping 2-5 business days requieres phone number and presence at day time at the given address! If you want to change seed beads color in some of the bracelets, just send us an email with photo of our bracelet made of desired beads - in most cases it is possible to do and there is no extra cost. If you want to change stone or spacers - there may be difference in price. So it is always better to choose stone and spacers you like and than request us for seed beads change. We use in our creations premium quality beads manufactured in Japan, Italy and Czech Republic and beautiful raw stones - stones are genuine and may present some visible imperfections (some scratch or incrustation) but gorgeous in its genuine beauty. We make each bracelet that you buy from us especially for you from the beginning - so there is no difference for us to make a standard size or a custom size. And.. we feel so happy when you send us exact wrist circumference in order note - it means your bracelet would fit perfectly! PLEASE ... send us your exact wrist circumference. Do not add anything to your real number, do not take measurement from other bracelets or watches - just measure your real wrist circumference just above your wrist bone. We us premium quality materials, including our stretch cord that we buy overseas from a renowned US manufacturer, we use best quality permanent glue to seal the knot. HOWEVER, anything can happen. In th worst case scenario in case you or your pet or your toddler broke the bracelet - do not worry - we offer a totally FREE service of repair - you just cover in/out shipping. Send us an email explaining your case, if the bracelet can be repaired, we will provide you our studio address. Than you just send us package with broken parts. As soon as we have your package in our studio we would send you a link for a flat 5,30 EUROS to cover return shipping. After payment is received we willrepair and ship in 1-2 business days. You received a gift and bracelet does not fit? You sent us wrong size and want to resize? You did not see that we offer a FREE size customization and ordered a standard size that is too loose or too tight for you? Do not worry - we offer a totally FREE service of RESIZING - you just cover in/out shipping. 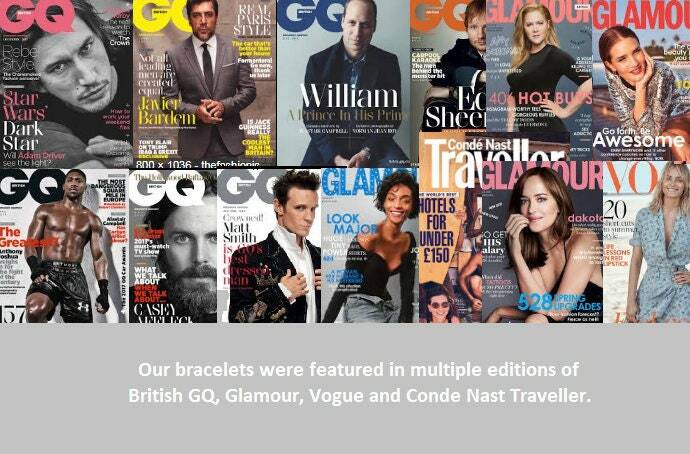 Send us an email explaining your case, if the bracelet can be resized, we will provide you our studio address. Than you just send us package with bracelet. As soon as we have your package in our studio we would send you a link for a flat 5,30 EUROS to cover return shipping. After payment is received we will resize and ship in 1-2 business days. 1. Give us exact wrist circumference at check-out. 2. Roll it on/off gently when you put it on instead of over-stretching it. 3. Avoid direct contact with perfume/alcohol/water.